Chicago fire.1 In a large part, this was due to its strategic location on the southwest shore of Lake Michigan. From the earliest times, the area around Chicago had been visited by all manner of water craft navigating the Great Lakes. The phenomenal expansion of railroads and canal systems by 1850 facilitated movement of people, livestock and goods.2 Growth in commerce and manufacturing followed. Livestock could be moved into Chicago from all parts of the Midwest creating vast stock yards which, in turn, rapidly turned Chicago into the meat-packing capital of the country. Lumber was transported from Wisconsin for the building, millwork and furniture trades creating a need for warehousing and factories which further expanded the city. The burgeoning city was a magnet for anyone wanting to “get ahead,” including recent European emigrants. The Irish quickly established themselves as part of the expanding city, organizing politically and developing an extensive support system through churches and social societies.3 While there was still prejudice against the Irish, and indeed against all emigrant nationalities, 4 Chicagoans in the 1850s were more interested in “making money” and less interested in a person’s background and pedigree. Jobs were available for those willing to work hard. It is easy to see why emigrants, including the Brown family, were drawn to the city. central Ohio, but, I have not found evidence that the rest of the family traveled with them. The information in the letter has been, and continues to be, vital to my research into this family. However, additional records have become available since the letter was written in 1943, and, more sophisticated methods have been developed to review these records. At this point, it may be helpful to have a picture of the basic family tree to follow along. This post, and the next one, is about Hannah Kelly Brown, the matriarch of the family. In subsequent posts, we will look at each individual on the tree, and, expand the tree to clarify the story as it progresses. Because Brown is such a common surname, to say nothing of the first names and use of “nicknames,” especially among the Irish, I found it helpful to look at the entire family as a group rather than at individuals to determine the locations of the family in Chicago. I referred to Chicago city directories,6 city, state, and US census records, along with cemetery records to follow the family, often referring back and forth to multiple records as the family revealed themselves. Edina Pl, name changed to Fourth Ave), with “Kate Connor.”8 (see right) No other record, besides the 1860 US Census, gives an occupation for Hannah Brown. Using the “family group,” I have found them in multiple locations in Chicago over a number of years. I have included a table below that identifies who was living at each address in each year. 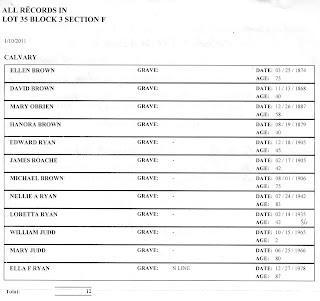 Because many of these addresses were for tenement houses or other rental properties, I did look in the city directories for additional people at the same address using a digital search function.9 While there were many, a few of the entries stand out as potential family members. The Illinois State Census for 1865 shows the Roach family, (Thos with 2 males under age 10, and 1 male and 1 female ages 20 to 30), within two lines of a “D Brown” (1 male and 1 female ages 20 to 30). The 1865 Chicago City Directory shows Thomas Roach (husband of Johanna Brown) AND David Brown at 221 Jackson. “Johanna” (see right) with Ellen Kelly, Michael Brown, and a number of other “Brown” people. I had seen this entry years ago, and while Hannah’s maiden name is “Kelly,” I did not think this was the correct entry, (and actually agreed with the David Brown letter that Hannah was living with her oldest son Patrick), until I looked at the Chicago Census Report for 1871 available at the Newberry Library in Chicago.10 The records show the following persons at r [rear] 219 Jackson and, I believe, suggest family ties. Brown, Michael, lab. R. 219 Jackson, ward 2, 1 male, 4 females, born Ireland. Are the individuals in Calvary Cemetery the same people in the Patrickswell church records? Timothy had brothers in Fanningstown named John, James, and Thomas. Is this family in Chicago headed by John Brown the brother of our Timothy? Is Ellen Kelly a sister of our Hannah? While I cannot say with any certainty, the evidence certainly points to that conclusion. It seems like every time we find additional records, we have more questions! We will pick up the story of Hannah Kelly Brown during the time of the Chicago fire and how the fire affected her and her family in the next blog post. Ruger, A., Map of Chicago in 1868 from Schiller Street north side to 12th Street south side, Chicago Lithographing Co., available online at the Library of Congress, https://www.loc.gov/item/73693350/ Birds-eye view of Chicago in 1868. Zoom in on the map for incredible detail down to individual buildings. 2. Cromie, Robert, The Great Chicago Fire, Illustrated Edition, Rutledge Hill Press, Nashville, TN, 1958 and 1994, p. 9-10. By 1850 there were at least 20 mainline railroad lines servicing Chicago. The Illinois and Michigan Canal completed in 1848 connected Chicago to the Illinois River at LaSalle, Illinois, and on to the Mississippi River. 5. Brown, David Earl, Kewanee, IL, 11 May 1943, Letter to Esther _______, Columbus, OH. Patrick, the oldest son, settled in Franklin and Delaware counties for a few years. John, the next son, settled in Columbus. However, both of these individuals lived outside the area which would have been covered by city directories making it difficult to determine if the remaining family members were with them. I have checked both the Columbus and Cincinnati directories for inclusion of the family. None was found in either city for any year. 6. 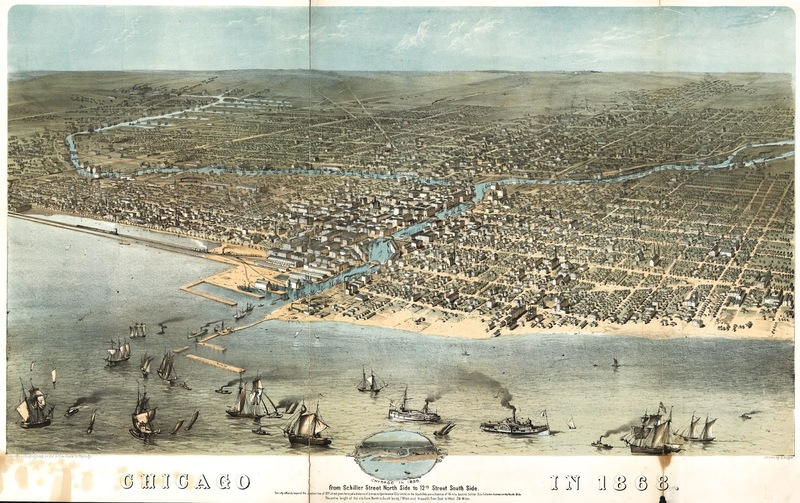 Chicago city directories from 1855 through 1887 have been reviewed for the family. These directories are available from multiple sources. I have used microfilms at the Cincinnati Public Library, Cincinnati, Ohio, and online records from Ancestery.com and Fold3 to gather data for the family. Please note that directories are not available for all years, and that, at times, there are multiple, sometimes competing, directories for the same year. Entries may be available in one source and not the other in the same year. 8. 1860 U.S. Census, Chicago Ward 2, Cook, Illinois; Roll: M653_164; Page 426; Image 430; Family History Library Film: 803164. Her occupation is given as “nurse.” Would this occupation have precluded her from having the two youngest boys with her? The distance between the two residences is about three miles. 9. City directories at Fold3 are in a digital format; however, searches use OCR (Optical Character Recognition). While this is a much better method than manually looking through each page in each directory, there are many false positives and likely other records where the OCR did not pick up the requested data. Because of this, some records may be missing. Also, note that not all persons appear in the directory for every year. Just as today, inclusion in the directory is optional. 11. 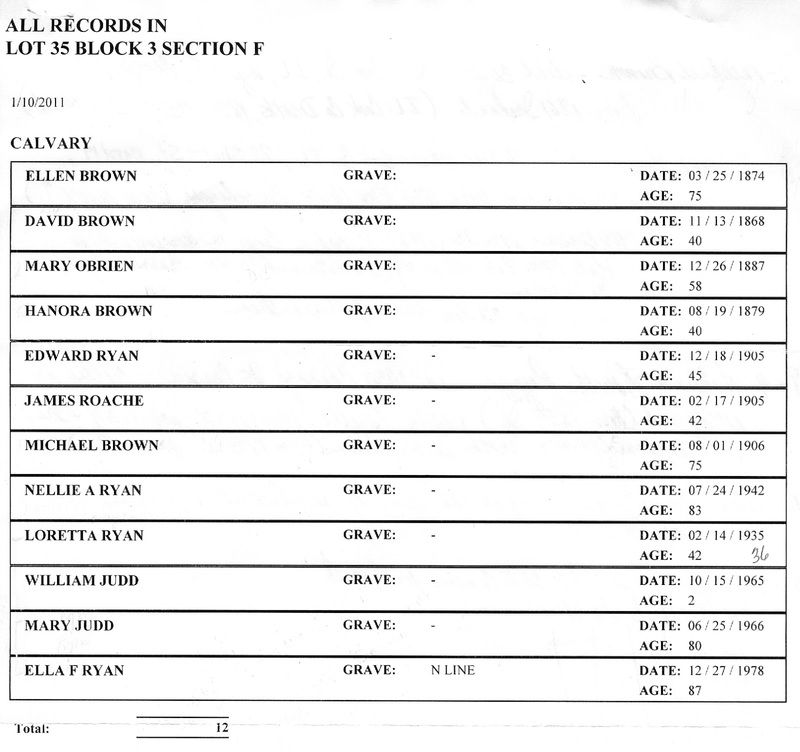 List of burials in Calvary Cemetery, Lot 35, Block 3, Section F, received November 2010. There is an additional burial for Edward Ryan who died 27 Dec 1890, age 2. A total of three burial graves were purchased by Michael Brown in November 1868. Multiple people, a total of 13 altogether, were buried in the same three graves. Additional information obtained by phone call to the cemetery on 14 Jun 2016. 12. Recall from the post, Putting them on the Fanningstown Map, that the Sales Catalogue for Lot 13 shows Thomas Hogan who took over the property previously occupied by John Brown, a brother of Timothy, in 1856. Perhaps John Brown died about this time and the family left Ireland sometime after to make their way to Chicago. While I have not yet found evidence to state this conclusively, this was a common immigration pattern for the Irish. The 1860 census for Johanna Brown and her husband Thomas Roach show a daughter, Emma, born in 1859 in Wisconsin. See Footnote 7. Once again, absolutely brilliant, Mary! Thank you so very much for sharing this knowledge with all of us, the descendants of these noble ancestors. Enjoying your posts very much. Glad you added a new post today, as I was just getting caught up since Joe Buggy blogged about you on his Townland of Origin blog. Did you attend the Celtic Connections Conference in Boston in 2014? I worked on the conference and your name is familiar.